Disambiguation: This article deals with the biblical area of Kidron Valley, i.e. from Wadi al-Joz to Wadi Qadum. The Kidron Valley is the valley on the eastern side of The Old City of Jerusalem, separating the Temple Mount (Haram al-Sharif) from the Mount of Olives. It starts north of the Old City of Jerusalem and continues east through the Judean Desert, towards the Dead Sea, descending 4000 feet along its 20 mile course. Kidron Valley as seen from the old city of Jerusalem. The modern name Kidron Valley applies to the the entire length of this long wadi, while the biblical names Nahal Kidron, Emek Yehoshafat, King’s Valley etc. might refer to certain parts of this valley located in the immediate vicinity of ancient Jerusalem, but not to the entire wadi. Looking across the Kidron valley from Mount of Olives towards the old city of Jerusalem, with Dome of Rock and al-Aqsa on Haram al-Sharif (Temple Mount) visible in far background. Steps leading down from old city of Jerusalem into Kidron Valley, the Absalom's Pillar is on the right behind the tree, Basilica of Agony (center) and the golden domes of the Church of Mary Magdalene (top right) are also visible. Tomb of Absalom (Yad Avsalom) in the Kidron Valley at the foot of Mount of Olives with entrance to the Cave of King Jehoshaphat (Maarat Yehoshafat) visible in the background to the left. Ein Rogel, also identified with Nehemiah's well (pictured here), was a spring on the outskirts of Jerusalem mentioned in the Hebrew Bible as the hiding-place of David's spies, Jonathan and Ahimaaz during Absalom's uprising against the role of King David. It may also have been a sacred place in pre-Israelite times. View of the Jewish Cemetery with tombs of Absalom, Benei Hazir and Zachariah at the bottom. The Jewish Cemetery on the Mount of Olives, including the Silwan necropolis, is the most ancient and most important cemetery in Jerusalem. The cemetery contains anywhere between 70,000 and 2 or 300,000 tombs from various periods, including the tombs of famous figures in Jewish history. Tomb of Zechariah in the Kidron Valley at the foot of Mount of Olives. 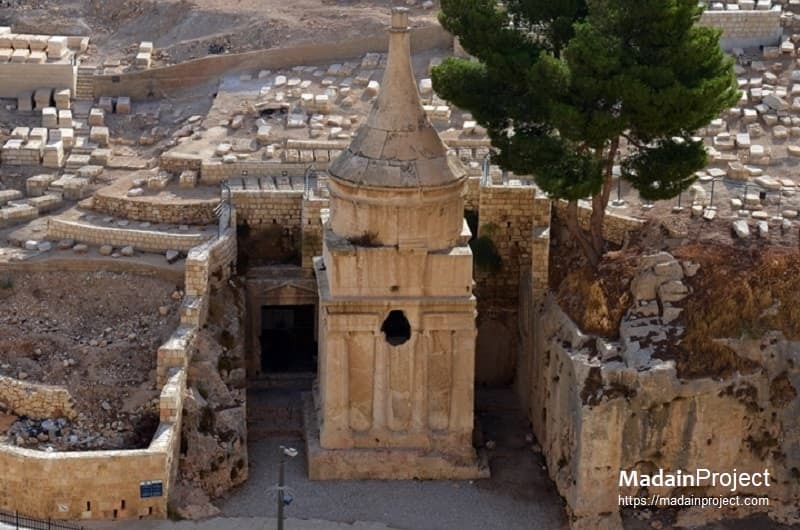 The Tomb of Zechariah is an ancient stone monument adjacent to the Tomb of Benei Hezir that is considered in Jewish tradition to be the tomb of Zechariah ben Jehoiada. The monument is a monolith, completely carved out of the solid rock and does not contain a burial chamber. The Church of All Nations, also known as the Church or Basilica of the Agony, is a Roman Catholic church located on the Mount of Olives in Jerusalem, next to the Garden of Gethsemane. It enshrines a section of bedrock where Jesus is said to have prayed before his arrest. Bab al-Rahamh Cemetery is a historic Muslim cemetery along the eastern wall of Haram al-Sharif (Temple Mount) in Jerusalem, dating back to the middle of seventh century CE. Three of Muhammad's companions Obada Bin Al-Samet, Shadad Bin Aous Al-Ansari, and Thabet Thou Al-Asabe’ Al-Tamimi are believed to be buried here. An aerial view of the Mount of Olives. Tomb of the Virgin Mary, also Tomb of the Virgin Mary, is a Christian tomb in the Kidron Valley – at the foot of Mount of Olives, in Jerusalem – believed by Eastern Christians to be the burial place of Mary, the mother of Jesus. View of the tomb entrance from the courtyard. Gethsemane at the foot of Mount of Olives, to the left is the Church of all Nations, most famous as the place where Jesus prayed and his disciples slept the night before Jesus' crucifixion. Monolith of Silwan at the Silwan Necropolis in modern day Silwan, also known as the Tomb of Pharaoh's daughter is a cuboid rock-cut tomb located in Silwan, Jerusalem dating from the period of the Kingdom of Judah; the latter name refers to a 19th-century hypothesis that the tomb was built by Solomon for his Egyptian wife. Gihon Spring or Fountain of the Virgin in the Kidron Valley was the main source of water for the Pool of Siloam in the City of David, the original site of Jerusalem.